‘Constricted’ heart in Farsi means missing someone or heartache mixed with frustration. Baba missed the Beloved. Coppersmith was a real profession in the ancient times. These people often cleansed the copper appliances with abrasive tools like sandpaper. So Baba tells us he is a coppersmith but his only tool is his heart, so he rubs the rusty copper of life upon his heart to cleanse. In other poems Baba talks about being grazing deer in wilderness. Because he was homeless and living outdoors. Also he was very poor so he was barely covered with rags, hence the title Oryaan (Naked). Baba was not accepted by the scholars of his time. They used to make fun of him. Now look at us today hundreds of years later on we read him, we listen to his wisdom, we love him and we need him. But no one remembers those so called scholars!? I see two points in this verse. All people are blades thus rubbed against the whetstone to sharpen themselves i.e. they are harsh upon others to gain benefit. In Baba’s case he is supposed to be one such a blade i.e. he is human but the Creator specially modified this blade into a steel hone!? So others run their blade upon him. So he suffers from all yet he was supposed to be a blade inflicting on others. This confusion, this voice within saying “although Allah made me this way but… I am that way” is the pointer to follow to know your Self for true. If you do not have this confusion then your spirituality ventured nothing. This verse is connected to the other previous two. This is a sense of Farsi sarcasm. Baba says in the previous verses that he is looking for a way out in peace. Well his sarcasm states there is no such escape. So his choices are like being the dungeons like Prophet Joseph (Koran[12:33]) or miserable moaning and crying. This is Baba’s signature wisdom. The gardeners are people and afflictions of life of this world and all harm that comes to us. And who created all that? The Beloved Creator! In spite of the fact the real source of all this hardship is the Beloved, Baba runs to the gardens towards the spirituality, beauty the grandeur of his Beloved any chance he got. Not only running but running smiling and laughing. If you wanted to know who Baba Tahir Oryaan was, this verse made the introduction. 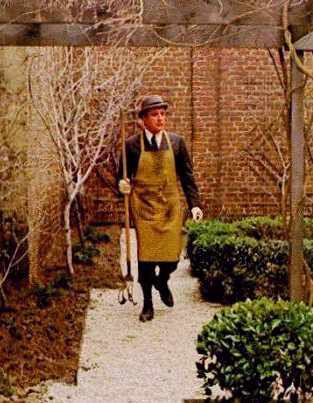 Background: Peter Sellers as ‘Chauncy ‘ the gardener in the movie “Being There”.